Over the years, Design Factory has become a familiar concept to many Aalto people. The test platform for learning, research and solving practical problems has also given countless visitors and partners a much broader view of what the concept of interdisciplinarity at Aalto University really means in practice. 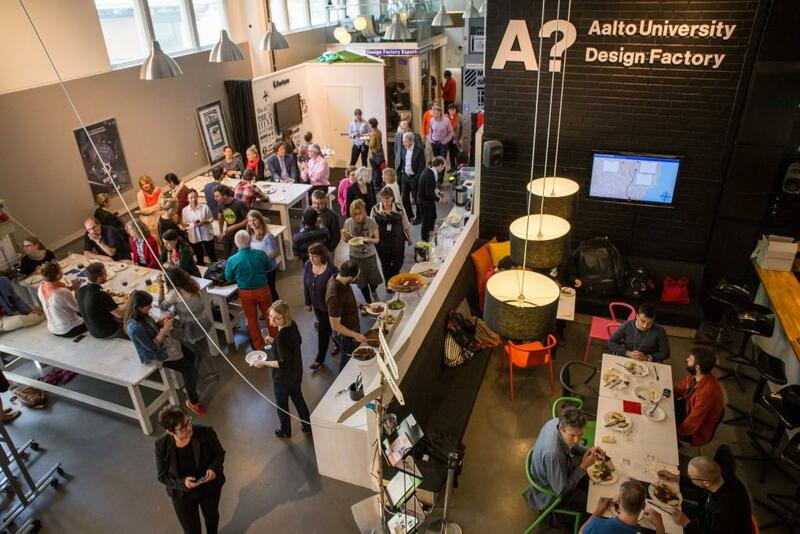 The Design Factory team recently received the Aalto High 5 award for building a sense of community at our university. The attitude of the people at Design Factory and their hands-on way to operate have been key factors in creating a unique, student-centred environment. The Design Factory staff have the ability to listen to user needs and encourage them to get things done and take action. Design Factory is also considered to be a source of inspiration for development work done at schools and institutions. The idea behind Design Factory was the long-standing awareness of a need for different facilities for learning and independent activity. Over the past seven years, the building, which was originally a VTT research laboratory, has gradually evolved according to the needs of its users. The premises are robust but comfortable, easy-to-use multi-purpose facilities. Design Factory looks like its users, because the people who built it also use it. ‘Design Factory is an example of how relatively light measures can turn a facility that was designed for a completely different purpose into something that is suitable for university use. Another advantage of a factory-like building is the fact that changes can be implemented easily and quickly – there’s no need to ask permission to drill every hole,’ says Kalevi ‘Eetu’ Ekman. And so far the need to improve or try something new has been continuous. Design Factory provides excellent opportunities for problem-based learning, team work, experimenting and prototyping. There is also a lot of cooperation with companies, and it has one clear target: to always serve better learning or research. ‘Companies have a huge number of real-life development ideas, and it’s our job to select the ones that are best suited for learning projects. The additional funding obtained from companies allows us to provide the student teams with a budget that they can use to bring their idea to the prototype stage. Thus, corporate collaboration is essential in many ways if we want to train the world’s best product designers,’ says Ekman. In addition to company and student projects, the presence of companies is important. Around 10 startup companies operate at Design Factory, so students and researchers meet corporate people on a daily basis. The companies, on the other hand, can use Design Factory facilities for prototyping and testing whenever there is capacity left over from teaching activities. From the very beginning, the people at Design Factory understood that proof of operational profitability was needed. Traditional academic indicators – publications, credits and degrees – are not enough, and other qualitative and quantitative indicators of activity and profitability have been created. The Design Factory annual report contains ideas and examples regarding how the operations are measured. Particular attention has been paid to how viable ideas, work methods, principles and practices could be disseminated to Aalto schools, departments, courses and other activities. Today there are four ‘in-house researchers’ who also study in theory what happens at Design Factory, i.e. how matters and ideas can be modelled, explained and possibly applied to other operating environments. The interdisciplinary themes of Design Factory research are typically related to areas such as product development practices, team work and developing expertise. Doctoral student Tua Björklund recently defended her dissertation on development work related to product design and entrepreneurship, and a couple of other doctoral dissertations are in the preliminary examination phase. ‘The Aalto mission culminates at Design Factory, when science and art meet technology and business on a daily basis in facilities, activities and people,’ explains Eero Eloranta, Vice President (Education), who encourages all of us to see our own small design factory in each of our work environments. So, what good community-building elements could be adopted from Design Factory? In addition to the ‘can-do’ attitude, people at Design Factory have a positive atmosphere, equality and a critical approach in common. According to Ekman, the staff dares to question things and they are also very quick in noticing how something can be fixed and implemented. ‘It is definitely not boring here! This place is not ordinary, hierarchical and inflexible – and every member of the staff contributes to solving unexpected problems,’ adds Pirjo Helander, who works as a project coordinator, while we are doing the interview. Their voices reveal a sense of satisfaction. ‘We have always had quite a lot of freedom in terms of building the Design Factory test platform, which helps Aalto University achieve its targets as a new, different and boundary-breaking university. We are really proud of this award and it encourages us to continue, be daring and renew!